Eye-popping magenta pink blooms, deep purple cutleaf foliage, sparkling red fruits and bright fall color give all-season appeal to this easy-care flowering ornamental. 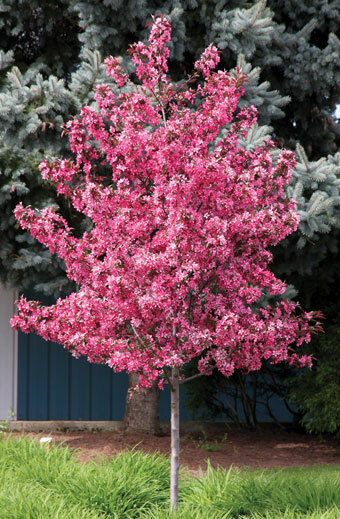 Superior disease resistance, adaptability, plus heat and drought tolerance make this unique crabapple a crown jewel among trees. 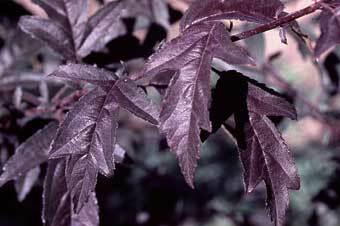 Refined, uniquely shaped leaves emerge glossy deep purple and maintain their rich color through the heat of summer. Fall color is a medley of bronze, orange and purple. Tiny, persistent, bright red fruits appearing in late summer are prized by wildlife and add winter interest. Strong branch angles and upright growth habit minimize the pruning and shaping needed to develop a balanced canopy. A top performer in windy climates, sturdy branches don’t become windswept as is the case with lesser cultivars. More vigorous than other purple-leaved cultivars, Royal Raindrops® Crabapple quickly gains caliper while developing a sturdy, well-tapered trunk.